Family-Friendly Lakefront Home In S. Hero w/ Private Beach, Dock. Boats Welcome! 2 Bedroom Home With Priceless Lakefront Access And Views! Haven is located on close to an acre large private lakeshore property. Private boat launch and dock. Private beach. Perfect location on Keeler Bay, incredible views directly north up Lake Champlain. 19 miles from Burlington (30 mins). Two bedrooms, one large bathroom. Recently remodeled kitchen. Large three season breezeway for additional sleeping in season. Antique swings, fire pit, games, apple trees, amazing lilacs and gardens. Beautiful year round! Phone/cable TV/wireless internet. Easy access to I-93, I-89, Burlington, Montreal. Let our home be a relaxing, private, and fun getaway! John, Erin, and Will (our son) live in Essex Junction, VT. John is a native Vermonter, from Essex, and Erin has lived in VT for 23 years (she grew up in Whitefield, NH). We work hard, but love to enjoy our time together and with family and friends, and enjoy our life in Vermont. Heavenly Haven is a special place to us. It is our dream to be able to live full-time on the lake when we retire. One of the reasons we choose to live in Vermont is for it's amazing natural for Lake Champlain! We love South Hero because it is close to our home in Essex and easy access to Burlington. Haven was owned for many years by the same family, and we want to continue to keep it up and enjoy the gardens, trees, and waterfront access. When we saw Haven - we fell in love with it and (so they say) - had to make it ours! Quiet, peaceful, beautiful views and amazing lake access at one of the most beautiful spots on the Lake. Large bathroom with separate tub, stand up shower. This location has to be experienced - so close to all major local amenities and attractions; hiking, biking, skiing, shopping (close to Burlington and Montreal) ice fishing, boating, ....or just relaxing and doing nothing but enjoying the views. Nice place to get away! We had a great time at Heavenly Haven. The moon rising over the lake on the first night was absolutely stunning. No pictures could do it justice. Sitting by the campfire was certainly enjoyable. Charlie (our dog) was thrilled with the space to run about. Burlington was a mere half hour away, and Mt Mansfield an hour away but the views were worth the drive and hike. Place was clean and better than expected. Would visit again and recommend to others. Thank you Erin and John. We are so happy you enjoyed your stay, moon views over Keeler Bay are stunning and we are glad you got to see it! We would love to have you back, thank you for taking such care with our home. 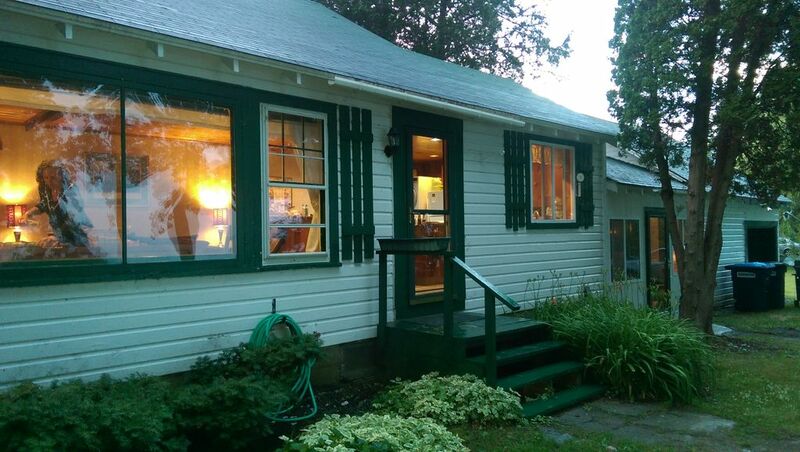 This cottage is a traditional Lake Champlain camp. Very comfortable, well stocked, and in a superb, rural location - with Burlington in quick proximity via Rt. 2 and US 89. South Hero has all you need for your stay, while remaining a small and relaxing place to get away, with a lot of character. Great area for biking, and the apple orchards and farms are wonderful. The camp itself was charming, and while located on a road with other cottages, was fairly private. Erin and John Knox were easy to work with, with quick replies via email -- they let us enjoy their camp without intrusion, and this was very much appreciated. We are planning to return. Thank you so much Mark! We are so happy you enjoyed our special spot on the lake. We would love to have you back!!! Second rental, just as nice as the first. This was our second stay at Heavenly Haven and we can't wait until our third! Everything was perfect. Dan, we love when we have people return each year...looking forward to having you rebook soon! Thank you for being such wonderful guests. Great hosts; very responsive and accommodating. Would recommend to anyone, no matterwhat the situation /experience you are looking for. Very clean :). Another peaceful, relaxing vacation at Heavenly Haven! We are sad to leave. The house is so charming and comfortable. We really appreciate being able to bring our dogs. Outside, we love the fire pit and swings. Inside, we love having a washer and dryer and wi fi. Erin and John are responsive but never intrusive. South Hero is small but still has a few stores and a pharmacy so it is easy to grab what you need. We hope to make it back again! Erica - we loved having you back! We appreciate your care and love of our special place. Please come back again soon!! Vermont farmhouse style in a lake house! A very clean, comfortable house in a great lakefront spot. Erin and John are great people. We look forward to coming back! No Smoking. Pets Allowed. Cleaning Fee $ 150.00. Rental Agreement Required for 6 nights or more stay. Bring your own boat! We have private boat launch and dock space. $ 25.00 additional person fee over 4 adults (14 yrs and up).